Cushing's Syndrome is NOT a nutritional disease, but an abnormality in the horse’s anterior pituitary gland, mainly seen in older horses. The anterior pituitary gland basically runs the entire hormone system of the horse’s body. In a horse (or pony!!) with Cushing’s Syndrome, the hormonal system is not normal, which causes some of the outward clinical signs we see in afflicted horses, like long, curly haircoat, failure to shed in the summer, weight loss (in some) and an increase propensity for laminitis. How can the feeding program help? We can minimize the effect of the horse’s feeding program on the production of the hormone insulin. Insulin tends to interfere with many other hormones in the horse's body, which will further complicate and already confused system. High starch/sugar diets will cause insulin to increase and further upset the hormonal balance in the horse's body. So, what we need to do is minimize the sugar/starch in his diet. Tribute Essential K is very low in starch (6%)/sugar (9%) and is fed at very low rates. Typical feeding rates are 0.5 – 2.0 pounds per day, which will meet the horse’s protein, vitamin and mineral requirements with minimal sugar/starch calories. Thus, the TOTAL STARCH/SUGAR INTAKE will be significantly lower than other feeds. For horses with higher calorie needs, like thin horses, we need to supply as many calories with FAT and digestible fiber as possible, as neither cause an increase in insulin production. 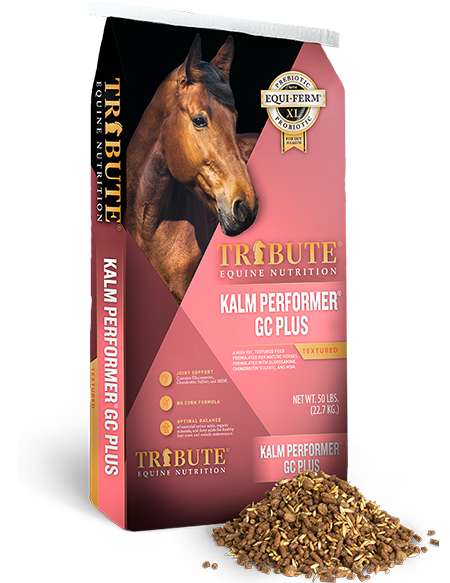 If the horse is heavy (body score over 6), just Tribute Essential K should be fed, according the Tribute Equine Nutrition Essential K Feeding Chart, with good grass hay. Ideally, the hay should be as low in NSC as possible. Hay can range from 8 to 21% NSC, averaging about 14%. Hay at or below 14% NSC would be best. The horse may also have access to Grass Assist Vitamin/Mineral Mix and Min-Plex Trace Mineral Salt. 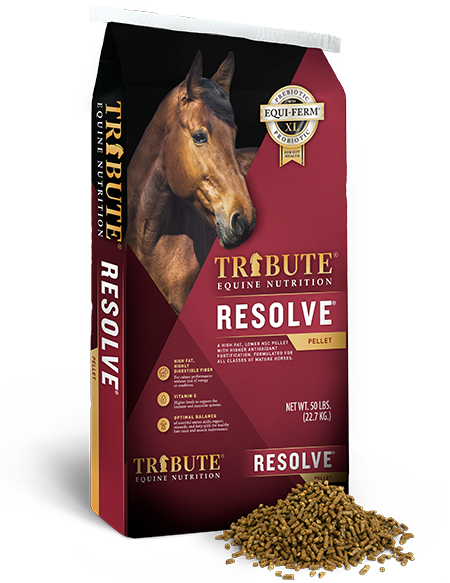 Tribute Equine Nutrition has developed feeding charts for Essential K for all weight classes of horses, including miniature horses and donkeys, ponies and small breed horses, light horse breeds, warmbloods and draft horses. Once the horse is at the desired weight (body score 5 or slightly less), we can add 2-4 ounces of Cool Omega 40 or 1-2 ounces of Cool Calories 100 PER DAY to help him stay there, if needed (he may maintain on just the Essential K). 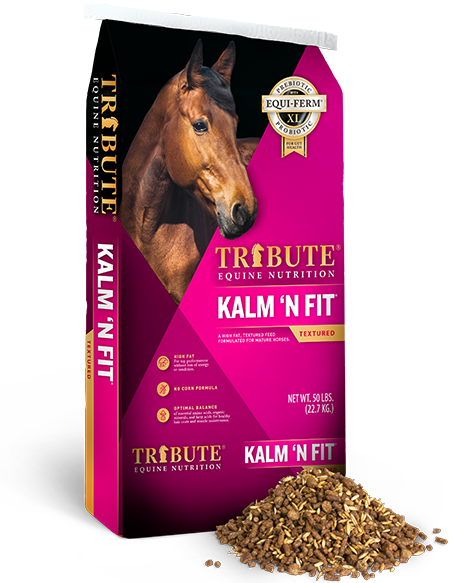 If the horse is thin (body score 4 or less), feed Tribute Essential K according to the appropriate Tribute Equine Nutrition Essential K Feeding Chart, with good, lower NSC grass hay. 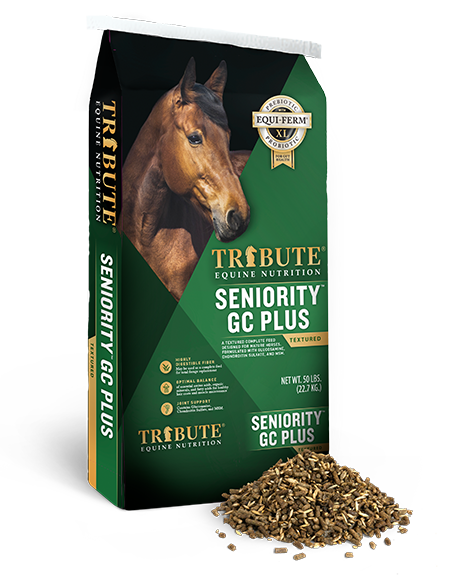 The horse may also have access to Grass Assist Vitamin/Mineral Mix and Min-Plex Trace Mineral Salt. Addition of Cool Omega 40 or Cool Calories 100 will help the horse gain or maintain his weight with little insulin response. The fat supplements can be fed at fairly high rates (up to a pound or more, if necessary) without a significant insulin response. Do not increase the Essential K to manage the horse’s weight, use the Cool Omega 40 or Cool Calories 100 to do that. Some horses may require more calories than Essential K and the fat supplements can supply. 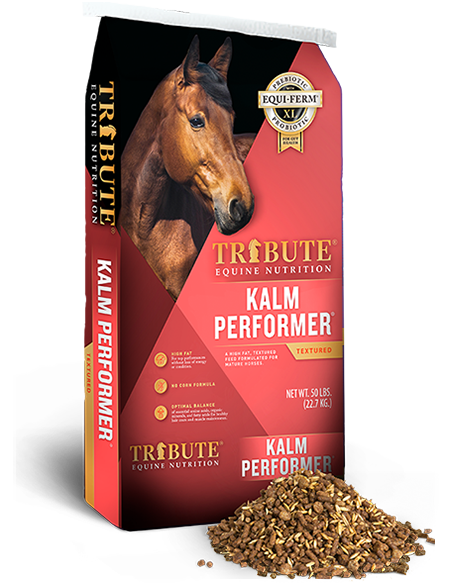 If this occurs, addition of small amounts (2-4 pounds per day) of Tribute Kalm N EZ to the Essential K /fat supplement program will help maintain the horse with minimal increase in starch/sugar intake. Remember that excess protein in the horse’s diet will be converted to glucose (sugar) in the horse’s liver. This is why grass hay is preferred over legume hay (i.e. alfalfa or clover) for horses with Cushing’s Syndrome. We can control the horse’s protein intake more precisely with Essential K.
Pastures can be quite high in sugars and starches, especially at certain times of the day and year. Also, pastures are typically higher in protein than hay made from the same field. Thus, it is suggested that Cushing’s horses spend minimal, if any, time on pasture, especially if the horse has a history of laminitis or is currently heavy. Turnout on a dry lot will afford free exercise and fresh air, but allow us to control the horse’s sugar, starch and protein intake by feeding grass hay. See the Research section of our website to view the results of a study conducted by Cooperative Research Farms, of which Kalmbach Feeds, Inc is a member. To our current knowledge, this is the ONLY CONTROLLED research study comparing the effects of low versus high starch feeds actually done in CUSHING’S and INSULIN RESISTANT horses!!!! The study is titled: Effect of Diet on Horses with Cushing's Disease, Metabolic Disease and Insulin Resistance, and can be found at the bottom of the Research page.